The median home price in the five-county San Francisco metropolitan statistical area in August was $660,000, up 2 percent from a year ago and just 6 percent below the previous peak of $700,000 in June 2007. Since hitting a post-recession high of $685,000 in May 2015, median home prices in San Francisco have declined on a month-over-month basis for three consecutive months, something local real estate agents said they have been observing. Four of the five counties in the metro area hit new all-time highs in 2015: Marin County in July, Alameda and San Mateo counties in June, and San Francisco County in May. Read RealtyTrac’s full September 2015 Housing News Report — available on Inman exclusively for Inman Select members. Bill Newland has a bit of a love-hate relationship with the San Francisco real estate market. “Real estate can be awful, but sometimes it can be wonderful,” said Newland, who owns a 32-unit apartment building in the historic Dogpatch neighborhood of San Francisco. It’s south of Mission Bay and AT&T Park, home of the San Francisco Giants baseball team. The apartment building, which Newland said he bought as a foreclosure during a previous housing downturn in the 1990s, represents the wonderful side of the San Francisco market for him. “I bought myself a job, but then I didn’t need to sell anymore because the building generated enough income right from the start,” Newland said. Newland continues to operate as an independent real estate broker as he has for 35 years, all the while also investing on his own. “I had to trade up over the years, and eventually, I was able to trade up to that (Dogpatch apartment building) in the ’90s. It was a bank property; the bank was just taking it back in foreclosure,” Newland said. But it took Newland surviving several awful economic downturns before he figured out how to ride the waves of the San Francisco housing market without wiping out. What are the experts saying about the Bay Area real estate market? “I went through a lot of recessions that were really rough, and I finally started paying attention and tried to time it better with the next recession,” he said. He noted that he thinks the San Francisco market is once again overheated and in dangerous territory. The median home price in the five-county San Francisco metropolitan statistical area in August was $660,000, up 2 percent from a year ago and just 6 percent below the previous peak of $700,000 in June 2007, according to RealtyTrac data from publicly recorded sales deeds. Although August was the 41st consecutive month where median home prices in San Francisco have increased on a year-over-year basis, the 2 percent increase was the lowest year-over-year increase during those 41 months going back to April 2012, the RealtyTrac data show. Median home prices in San Francisco have declined month-over-month for 3 consecutive months. “During the summer months prices have leveled off and even though we still have multiple offers, if you know your market and know the other agent, there is more opportunity to achieve your goal of getting your buyer into the house they want,” said Geraldine Ramirez. Ramirez is a Realtor with the Bay City Real Estate Group who got her start in real estate 10 years ago as a short sale specialist and is now helping those former short sale clients buy again as so-called “boomerang buyers” all across the San Francisco metro area — and sometimes outside of California. Vince Sheehan is a broker with Re/Max Gold, which focuses on Marin County north of the city of San Francisco. He said he also has noticed a slight cooling off in the local housing market over the past few months. 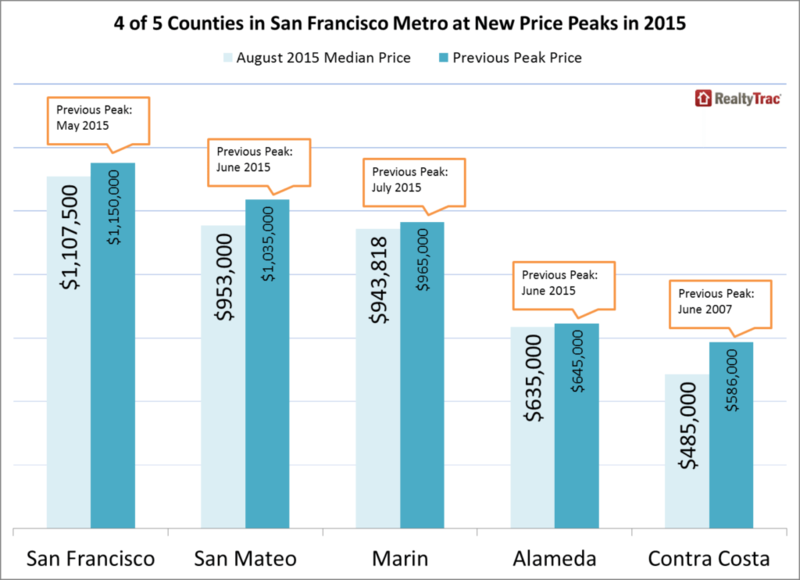 Are prices still rising in San Francisco? Still, local real estate experts agreed there are pockets of the greater San Francisco metro area that have exceeded their all-time highs in terms of home prices. RealtyTrac data show that four of the five counties in the metro area hit new all-time highs in 2015: Marin County in July, Alameda and San Mateo counties in June, and San Francisco County in May. The only exception was Contra Costa County, across the bay east of the city of San Francisco, which in August was still 17 percent below its previous peak in June 2007. But Contra Costa County prices are surging as buyers flee to the outskirts of the metro area to find more affordable housing, according to David Dufresne, broker and owner of Solutions4realestate who works mostly eastern Contra Costa County in the tri-cities of Dublin, Livermore and Pleasanton. Check out the most affordable Bay Area markets. As home prices have risen dramatically over the past several years, reaching new all-time highs in parts of the Bay Area, banks have pulled back on approving short sales, which makes life tougher for homeowners still underwater who want to sell, according to Dufresne. “The lenders seemed to have disbanded their short sale negotiation teams,” said Dufresne, who noted there are only 71 short sales and 56 bank-owned properties that were listed for sale in early September out of a total of 3,233 total listings in Alameda and Contra Costa counties combined. “Because they’ve moved on, they’ve moved the best people on, at least in this area, and so they seem to be a little more difficult,” he said. RealtyTrac data show 3.3 percent of all single-family home and condo sales in the San Francisco metro area were properties in the foreclosure process — often short sales — in August, down from 4.1 percent in August 2014 and down from a post-recession high of 37.8 percent of all sales in January 2012. 3.3 percent of all single-family home and condo sales were properties in the foreclosure process. Not a Select member? Join today.